Our Wild Birds: Window Strike!! It is so distressing when a bird strikes the window. It happens to us on a too regular basis. Seems that it is always the nice birds, never a Grackle or Starling. One year it was a black throated blue warbler and a kinglet. 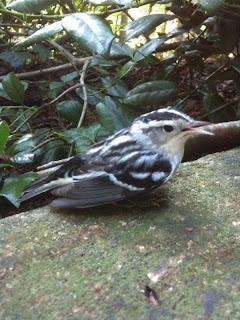 This migratory season we are starting off with a black and white warbler. This one I believe will survive. The migrants sure do have it rough.